The Sardar Patel Stadium in Ahmedabad can hold a crowd of almost 50,000 and is one of the bigger grounds in the country. Named after India's first Home Minister, Sardar Vallabhbhai Patel, the stadium was built within a span of nine months on a 50-acre stretch of land donated by the government. It is also called the Motera ground because it is located in that area of the city, and has seen many a record being broken. The ground hosted its first Test match in 1983 when West Indies beat the home side by more than 100 runs. Later in the 1984-85 Australia-India series, Sardar Patel Stadium went on to host its first ODI, one in which Australia beat the Indians. Sunil Gavaskar became the first-ever cricketer to score 10,000 runs in Test cricket on this ground – a feat he achieved against Pakistan. Kapil Dev also surged past Sir Richard Hadlee's record for the most number of wickets in Test matches here, after earlier having made a nine-wicket haul in his career also at the Motera ground. In 1996, the ground hosted a low-scoring Test match against South Africa, where the tourists faltered while chasing a paltry 170 for a win to end up at 105 all out. Javagal Srinath had scalped six wickets in the innings. However, South Africa had their sweet revenge when they bowled India out for 76 runs in the first session of the Test match in 2008 and then went on to win it by an innings and 90 runs. The Motera was also one of the venues for the 2006 edition of the Champions Trophy, with five of the 15 games being played here. It has also hosted one game in each of the two World Cups that were played in the country, including the first match of the 1996 World Cup between England and New Zealand. 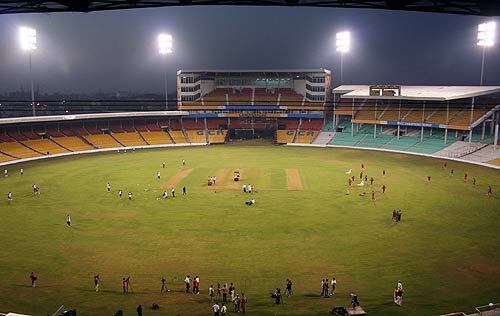 Motera has hosted four Rajasthan Royals games during the 2010 season of the Indian Premier League.